We recently received a question from a reader whose name is Samantha. Samantha asked about the benefits of contributing to a RRSPs (401k for our American readers) for younger investors under the age of 30 who have other debts. My first reaction was – how would I know? It’s been almost a decade since I turned 30, but then I calmed down and looked at her situation and came up with a few suggestions. In addition to my own suggestions I contacted Preet Banerjee of WhereDoesAllMyMoneyGo.com who is much more knowledgeable than myself in these matters, to get his opinion as well. You can think of it like a Pros vs. Joes match! 🙂 A big thanks to Preet for helping out with this one. 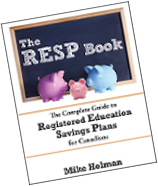 If you are wondering when the rrsp contribution deadline is then check out my RRSP deadline page. Samantha is 25, married with a steady job. OSAP (student loan) = $28,000 at 8% – minimum payment is $309 per month. Samantha makes $34,500 and her husband makes $49,000. She has an employee match of 100% for up to 3% of her salary in a group rrsp. Currently her rrsp is about $300 (hey, she’s young!). Should she focus more on debt rather than rrsp? Since she is young she has lots of time to contribute to the rrsp later. Should she contribute to the rrsp to get the employer match? The first question is the old “debt vs investment” question which I won’t get too far into since the answer is that in a lot of cases it doesn’t really matter where you put your money since both rrsp and debt reduction are very positive actions. Her student loan does have a higher interest rate (8%) but since student loan interest is tax deductible in Canada, the effective interest rate should not be excessive. It’s possible that the rrsp will outperform the interest rate of the loans but since we can’t predict the future, there is no point in guessing. If you have excessive debt where the payments are crushing your lifestyle then perhaps the debt repayment should get priority. If you have very little savings then you might want to contribute more to an rrsp since it can act as a safety blanket if times get tough. At $34,500 her marginal rate is 21.05% in Ontario which means her after-tax interest cost on the student loan is 6.32%. If cash-flow is tight (normally the case at that age), then they could consider shopping for new financing on the loan for less than 6.32% with a similar (or shorter term), or for more flexibility they could even pull that into the mortgage (you’d have to check to see the costs for doing so, namely if you have to pay a top-up premium for CMHC premiums). If the mortgage rate is under 6.32% they would free up a fair bit of cashflow. It is important to note that the debt now becomes longer term, so if considering this you would want to make sure the savings are re-directed into something beneficial (mortgage top-up payments, savings, etc.). If the husband is not maximizing his RRSP contributions, they would yield an extra 10% for spousal RRSP contribution refunds if he makes them to her spousal RRSP account as his marginal tax rate is 31% versus her 21%. If they do end up consolidating debts, the extra cashflow (perhaps $150 to $200/month) could additionally be used for further RRSP contributions with the refunds going to accelerating the mortgage (or paying down vehicle loans, credit card balances etc.). The question of contributing to an rrsp with an employee match is a no brainer – there are very few circumstances where you should not be contributing to an rrsp with an employer match. To do so is leaving money on the table, so if nothing else – contribute enough to get the match. I would most certainly take advantage of the matching – that is free money! Don’t even think about it, just do it. Both Preet and I agree that utilizing the 3% employer match on her rrsp should be a top priority. After that she can split her extra money on debt repayment and rrsps. The exact proportion will be up to Samantha, but considering that her rrsp is very small, she might consider giving more money to the rrsp at first in order to build up a bit of a safety net. Preet made a great suggestion that the husband should be making the extra rrsp contributions into a spousal rrsp since he is in a higher tax bracket. In other words Samantha should make the 3% contribution to get the employer match and then after that, any contributions will go into the spousal rrsp account. Preet also came up with the suggestion of consolidating their loans which might free up cash flow to further paydown debt. Anybody else want to add to this? Please note that I am not a financial advisor so it’s important to do your own due diligence (sorry Mr. Cheap). Feel free to check out Preet’s personal finance blog. Assuming she can’t refinance the student loans lower than 6%+, I would advise her against contributing to her RRSP beyond the 3% match (which I agree is a no-brainer) and instead pay her student loans down aggressively – a guaranteed 6%+ return. She can’t get that from an investment at the moment. Her RRSP room can build until she is in a higher tax bracket at which time she’ll benefit more from the deduction. If she is still in the same tax bracket when her student loans are paid, I’d recommend that she hold her savings in a TFSA until she’s earning more money. Thanks for the mention FP! To add to Jo’s comment, and for anyone who expects to quickly move up tax brackets, you can also make your RRSP contributions and defer claiming the deductions until you indeed are in the higher tax brackets. That way if you think the market is at a low as some might, you can make the contribution to get the growth on the investments now, and claim the deductions when your tax rate is higher – giving you the best of both worlds. Of course, there is no guarantee that just because a market is down it won’t continue to do so. When paying off debts, you know what your “rate of return” is. It’s hard to answer (1) but like you guys say (2) is a no-brainer. Contribute 3% and get the 100% match. That’s a 6% annual RRSP contribution for someone who is 25 and if invested wisely will let compounding do its magic. If it were me, I’d leave the debt alone and go full-speed ahead with the RRSP. 6% after-tax is sufficiently cheap leverage to come out ahead in the long term, but then again I’m pretty risk-tolerant. In the end, you have to do what makes you comfortable, but phrases like “I’m young and have plenty of time to contribute later” make me nervous. For starters, that often doesn’t happen because it keeps getting pushed off for other goals and 2nd, a dollar invested when you’re young is worth several times more than a dollar invested a decade or so later. I agree with Jo’s comments (and most of the advice given). It seems to me with a $212k mortgage and $309/mth minimum payment on student loans, most of their cash flow must be eaten up by debt payments. Personally, I would try to reduce those as much as possible first. About 7-8 years ago I was in a very similar situation to Samantha. I concentrated on paying off my student loans 1st and foremost and had very little to nothing in retirement savings. Today, my husband and I are debt free and have a pretty decent retirement portfolio that we continue to contribute to. Starting retirement contributions early is great but getting out of debt, and staying that way is better imo. Jo – keep in mind they can use a spousal rrsp which will give a bigger tax benefit. I agree though the student loan is a guaranteed return. Kyle – very reasonable advice. If it were me however, I’d be concerned with the level of debt ($240k) since they only make about $85k or so. I would worry more about the debt repayment (after the 3% match) until the debt is reduced a bit – maybe if the debt is $200k then they up the rrsp contribution etc. Telly – you make a good point that just because someone concentrates on their debt at first doesn’t mean that a) it will take forever and b) they can’t still save for retirement. I agree Mike, the debt to income ratio seems high, which is why I advised to pay off the student loans 1st. 25 is still quite young (and my initial reaction was similar to yours 🙂 ) so they really do have plenty of time to get started once their debt is lowered. I think doing both is a very good approach. The main thing is that you are saving (both in the rrsp and paying off debt). When I graduated from University with my second degree, I had 17K in student debt. Upon graduation I earned a healthy salary and contributed fully to my RRSP. I then applied my tax refund (which was large due to student credits and my RRSP contribution) to the debt. I was outta debt in 6 months. Thanks for the great advice everyone. I hadn’t really looked into Spousal RRSPs yet so I’ll take a look. Our house closed today so I’ll keep you posted on how things go. Squawk – that’s pretty impressive. Were you living at home during the time of debt repayment? Samantha – no problem, it was a lot of fun. Good luck with the house. 1. By focussing on the relative after tax-rates earned (in RRSP/401k/Superannuation) or saved (in debt reduction), we are focussing on just one part of the cause, rather than the effect. 2. Surely the OBJECTIVE is have the most money at the END, not the lowest cost NOW? 4. A far better option is to put the money into an income-producing real-estate investments … over 30 years in produces somewhere near a 50% better overall return (and, that’s assuming that you don’t use the increasing equity in the property to buy more!). I wouldn’t recommend that anybody who is more than 10 years from retirement contributes ANYTHING to their RRSP/401k/Superannuation UNLESS they have no interest in investing (in which case, I agree with your analysis). Four Pillars: Nope, I was not a boomerang kid. Back then, I rented a little basement suite from a nice family for $550 a month. I didn’t own a car. I opted to ride my bike to work over taking the bus. I was terrifically thrifty and fantastically frugal. I hated the debt more than I liked “stuff”. So I made it my mission to retire the debt and at the same time fund my retirement. It worked. AJC – I’ll be looking forward to that post. Squawk – you must have made some pretty good coin to be able to delete debt to the tune of $17k! I’ve been paying off my student loans to the tune of 20,000 yearly. I live in a small, low-cost town and make a good salary — 83,000 PA. I can live comfortably on less than half my salary: no car, rental apartment, Gail Vaz-Oxlade’s ‘jar’ system. It sounds impossible, but all you have to do is live like a student while making a real salary. I have one year to go, and the loans will be dead. 3) Your comment on the employer match is incorrect. Ultimately, the added rate of return of an employer match depends on your time horizon. You can’t simply add the interest rate with the % match. What really matters is the $ value of the match vs the $ value of market returns over your horizon. 4) Not to debate returns on real estate investing vs RRSPs, but you can’t really compare since one is a leveraged investment an the other is not. Its apples and oranges. jrochest: I think that’s the key to starting out on the best foot financially – live like a student for a few years once you start working, then slowly increase your lifestyle (always staying within what you can afford). Instead people buy their dream lifestyle on credit and the party eventually ends. Interesting that you use Gail Vaz-Oxlade�s �jar� system (kinda like Dave Ramsey’s envelopes I guess). Did you have problems budgetting / over spending before you started using her system? That’s a good point Mr. Cheap. It seems like these days people don’t believe in starting slow or “starter homes” anymore. I was having a conversation with my in-laws a few weeks ago and they talked about the tiny one-bedroom apartment they lived in with two kids for a few years. My parents have a similar story. It’s rare you see that anymore. Most people have bought their dream home before even having children to fill it (if they do). Another big thing now is that you have to have a separate bedroom for each child. Apparently sharing a room is passe. You’re right Mike! 🙂 And it’s too bad because I love that I shared a room with my sister. I’m sure there were times when I was annoyed but overall, I think it made us a lot closer. Telly you brought up the most interesting thing. Of the people my age that I know I’m the only one with my own home. Most still live with their parents. I disagree with the idea of living with your parents till you’re 30. In fact I have married friends living with their parents indefinitely. In my case I bought a house I felt was within my means and met my life goals. It works out to marginally more expensive than renting was but I’m working toward something I very much want and I have done a thorough cost analysis to ensure I can afford it. And I must say that I agree that the key is to continue living like a student. Having been an OSAP student I know full well that I can live off of 9 thousand dollars a year – a feat that not many can pull off. All great Great advices. I really appreciate all the contribution. i have few questions though. 1) Is samantha is seriuos about her retirement or just want to use RRSP as a tool to save taxes? 2) I DONT see any big reason for consolidation. i mean just by assuming tight cash flow………. do you still need to consolidate!!!! 3) regarding RRSP if u realize the power of compunding its better to contribute as early as u can. 4) make use of RRSP to reduce your mortgage. 5) make all your non tax deduntible debts in to tax deductible. First decide what exactly you want to achive!!! Telly – I think sharing a room is great for a little kid. That’s what ours are going to do for a few years. Sam – I’m not a fan of living with your parents as an adult – if you can handle it, fine but I don’t really think it’s all that “cool”. I’m a little confused about what percentage of OSAP interest is tax-deductable. In the analysis it seems that tax-deductions made the 8% interest on the loan reduce to 6.32%. That doesn’t seem like much at all. As is my understanding, in the US 100% of student loan interest is tax-deductable, if you earn below a certain amount (something like $50,000). Is this not the case in Canada? This link also gives me the impression that the interest is refunded when you file your taxes. Monty – as far as I know, you can write off all of your student loan. Yes, you get the tax rebate when you file your taxes. Umm.. OSAP and approved student loans are NOT tax deductible. They yield a non-refundable tax credit. Big difference. It is independent of your income tax bracket.